Getting a spacious tent that gives you easy access in and out of the world is not easy. Most tents have squeezed exits that leave you aware of the limited space inside. Coleman Back Home Instant Screenhouse tent has distanced itself from this definition. Get yourself one of this during outdoor activities and feel the space in a whole new world. Measuring 48 x 13.8x 10.2” and weighing 45.2 pounds, Coleman Back Home Instant Screenhouse is the perfect idea for enjoying nature’s beauty. The tent is made of durable Polyguard double-thick fabric and has telescoping poles to ease setup and save space during storage. 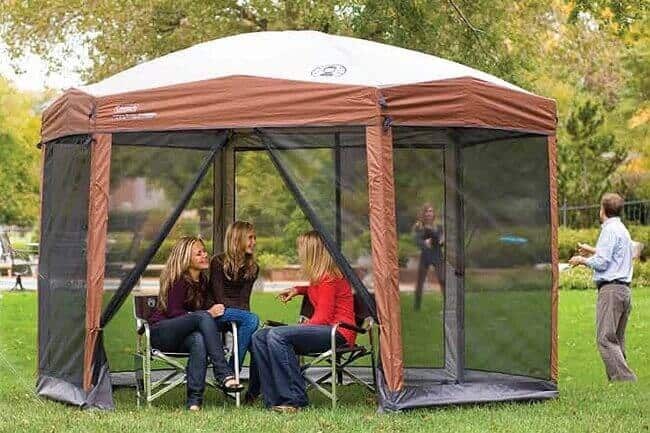 At that time when all you need is that cool breeze in the middle of open ground without obstruction, dust irritating your eyes or suffering a bite from a bug, this tent is your perfect choice. You want to experience freedom gaining unlimited access to your tent like you would in a real open resting. The tent makes this possible using two large doors, one in the front and another at the back. Obviously, you would want a tent that takes care of the challenges brought about by your environment leaving you ample time to enjoy quality time with together with your guests. This kind of convenience does not only offer value for money but also redefines leisure. The Coleman Back Home Instant Screenhouse provides near-home care-free experience. No wonder, its name "Back Home" serves to reinforce the assurance. 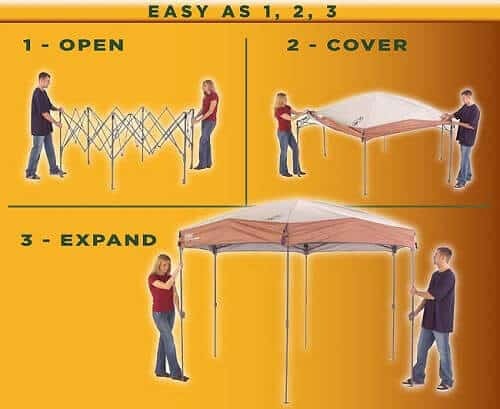 The tent takes only 3 minutes to set up in just three steps. Offering 90 square feet of shade, insect and dust protection, mesh screen, loops for keeping the doors open, and zippers for shutting the pop-up tent lives to its promise of affording you convenience that can only be available at home. With all these quality features, it should be quite easy to choose this kind of tent whenever you are shopping for a camping tent. The convenience that comes with Coleman Back Home Instant Screenhouse is extended in its storage and transportation. Wheeled carry bag lets you comfortably move the canopy from one place to another saving on time and effort required to carry the bulky load into your car. The creatively designed bag maintains the quality of your tent awaiting the next use. You would prefer a product made considering "what if" conditions on user safety. You are guaranteed of safety while using the product just in case you forget taking caution while using the product or another person not familiar. 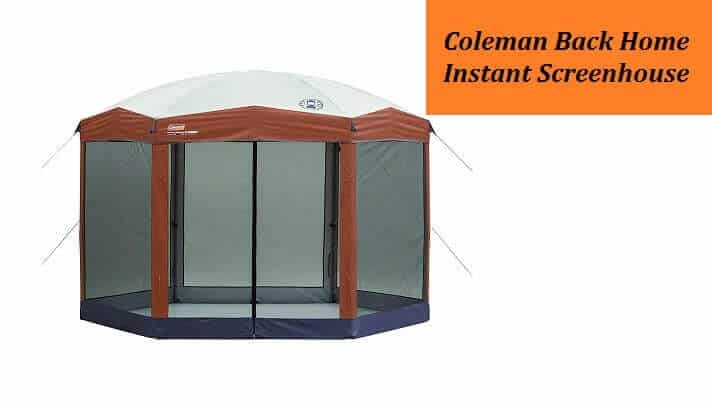 Coleman Back Home Instant Screenhouse is made with Comfort Grip technology to lock the canopy in place to avoid pinch while extending the pole. You should consider the canopy if safety is your priority in obtaining the value for your money. With the increased awareness on how harmful high-intensity sunlight beams can be, it is only safe to protect yourself, family and friends when enjoying quality time under the tent. The tent is made with UVGuard technology to filter out ultraviolet rays of the sun capable of causing cancer of the skin. The technology instantaneously switches into action when the tent is set up. It makes a lot of sense to have two broad exits in the event there is need to evacuate from the tent. You would want a canopy that has been made to easily avoid danger when it is so near to you and your loved ones. Your safety is enough reason to make you consider this kind of tent among other types during a purchase. Coleman Back Home Screenhouse is the perfect choice for hosting guests. It is spacious and can have its vaulted ceiling adjusted to cater for taller people. You would not want to embarrass you guests bowing all the time! The screened shelter will enable your guests enjoy the tranquility of an outdoor experience free from bugs, wind or harmful ultraviolet rays form the hot sun. You should consider this canopy tents to earn the accolades of a perfect host.